Sometimes, the universe drops the answer to your next photo prompt directly into your lap. Or rather, into your back yard, if you want to get technical. It is–no exaggeration–10° outside, and it feels like -6°. For some of you, this may be a standard-issue walk in the winter park. But for others (like me! ), this is flippin’ cold. And in the face off all this frozenness, I can’t help but feel bad for the animals outside. I remind my cats of how lucky they are that George lets them squat indoors (and by “squat” I mean, run the household, and they barely move from the goose-down comforter when I tell them this, little spoiledy-cats), and I went out and got a bunch of food for the bird feeder. Today, the birds were all over the yard. 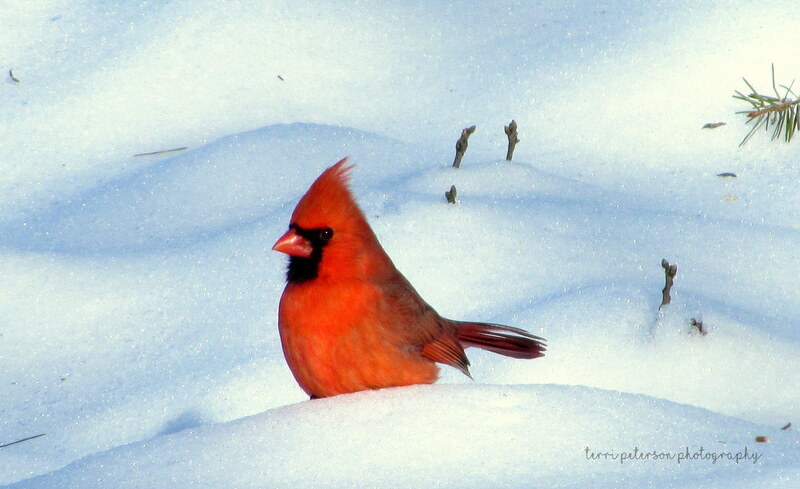 Juncos, starlings, jays, and this regal fellow, the Northern cardinal, decked out in namesake red. Of course I had to take advantage. Tossed open the shutters and threw up the sash, or something like that. I appreciate that Mr. Cardinal looks like he’s giving me a stinkeye, even though he was at least 50 or 60 feet away from me and my guess is I’m heavily anthropomorphizing. Let’s hear it for the zoom feature. And yes, I know, there’s a legend that cardinals represent visits from dead loved ones. I have a cardinal-friendly yard (scrubby bushes near an open field, ample water and food, etc) so I think his visit had more to do with that than with an aviary version of The Walking Dead. But hey, we do our feel-good however we can get it. Enjoy!